Microsoft SharePoint is one of the most business-critical services in enterprise IT. SharePoint is widely used by organizations to create websites where information is centrally stored, shared, organized and accessed by users from anywhere, any time and any device. Major use cases of SharePoint include knowledge and content management, intranet, file hosting and collaboration, and so on. It is important to monitor SharePoint because any fault, failure or performance glitch in SharePoint operation will directly affect the end user experience and business continuity. Common problems affecting SharePoint performance include slow web pages, high content growth, database connectivity failures, authentication issues, and so on. With real-time access to SharePoint health metrics and KPIs, SharePoint administrators will be able to detect and diagnose anomalies and triage them before they become business-impacting problems. In this blog, we will look at the top 8 metrics that a SharePoint administrator would need to look at to get a holistic picture of their SharePoint Farm and monitor performance. A SharePoint Site is a website containing SharePoint web parts and a Site Collection is a top-level site having a collection of SharePoint Sites. For example, a Site Collection could exist for the sales team of an organization, and under this site collection there could be different sites, such as Inside Sales, Outside Sales, Sales Engineering, Sales Support, and so on. A SharePoint administrator needs to monitor Site availability, which is critical to understand the whether it Site is accessible or down. Additionally, tracking the growth of Sites and Site Collections, most and least active Sites and Site Collections, etc. is important to keep a check on what Sites are getting added and how frequently they are getting used. 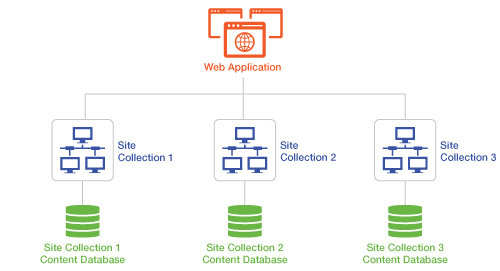 Web applications are the top-level containers for content in a SharePoint Farm. 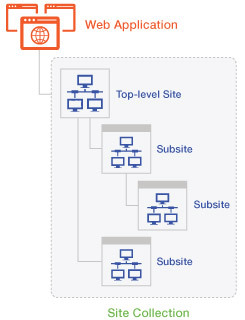 A web application is associated with IIS configuration and consists of a set of access mappings or URLs defined in the SharePoint central management console. These are replicated by SharePoint across every IIS instance. SharePoint admins need to monitor the content growth due to web applications, number of users accessing web applications, content databases used, etc. Web parts are the server-side controls that run inside a web part page. 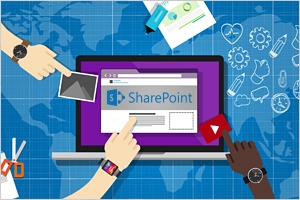 They can be considered as the building blocks of pages that appear on a SharePoint Site. Identifying slow web parts is important. When a user complains that SharePoint access is slow, it could just be that one web part that is causing slowness, but for the user perspective, their entire SharePoint experience may be considered poor. As SharePoint users grow and they start creating many web pages and content, there will be documents uploaded and stored. Deprecated and old content would have to be archived or removed. Bloated content databases would make read/write processing slow and affect SharePoint experience for all users. Admins will need to track the number of document libraries, documents and attachments and their growth over time. It is also imperative to know what types of files (text files, data files, audio and video files, database files, executable files, plug-in files, disk image files, developer files, backup files, etc.) are stored and what file types are taking up more space. SharePoint databases are the repository where all SharePoint documents and files are stored. A web application powered by the IIS server can have one or more content databases. And each content database can be configured to work with more than one Site Collection. Understanding the mapping between the content database, Site Collection and underlying Sites is critical. SharePoint admins need to know which Site is using up more storage in the database, and if there’s a problem in the database, which of its dependent Sites/Site Collections are affected. In addition to monitoring the content database’s disk space usage, one needs to monitor the orphaned items and the recycle bin. A bloated recycle bin can eat up considerable storage when left unchecked. In addition to the content database, other databases such as the configuration database, app management database, search administration database, analytics reporting database will all have to be tracked as well. The SharePoint Server is one of the most critical components of the SharePoint Farm as it is central to all services executed by the SharePoint application. A problem in the server could impact almost all operations of SharePoint and affect application availability and performance. From a server standpoint, it is critical for SharePoint admins to monitor alerts from SharePoint Health Analyzer, which performs automatic checks for potential configuration, performance, and usage problems in the server Farm. SharePoint allows admins to customize rules in Health Analyzer regarding the types of errors to be detected. There are even options for automatic repair. Errors captured by the Health Analyzer are available in reports in the Central Administration user interface. Admins can also use Windows PowerShell to set up email alerts from the Health Analyzer. Timer jobs are key services in SharePoint. They are recurring processes run in the background on a schedule. A timer job contains a definition of the service to run and specifies how frequently the service is started. Many features in SharePoint Server rely on timer jobs to run services according to a schedule. Depending on the environment, the failure of some timer jobs, such as Outgoing E-mail Alerts, may not pose an immediate problem; but if a timer job responsible for pushing Farm configuration changes out to the SharePoint servers begins to fail, the results could be catastrophic for the Farm if the issue isn’t dealt with immediately. Diagnostics provided through the Unified Logging Service, aka ULS logs available on the SharePoint server can help in troubleshooting of Farm problems. These logs are text files where each line contains a unique event has a time stamp, the related Farm component, its severity, description of the problem and other useful information relevant to the event. Admins can use PowerShell to filter the logs and export it to Excel. There is also a ULS viewer utility from Microsoft that can be used to view the logs. It was designed for SharePoint 2013, but also works for later versions. Another important thing to monitor is the backup and restore operations on a SharePoint server. These functions include Farm backup and recovery, granular backup and recovery, and recovery from an unattached content database. These operations can be performed using the SharePoint Central Administration or PowerShell cmdlets. Monitoring the successes and failures of these operations is critical for SharePoint performance management. This is the feature in SharePoint that manages incoming requests. By processing the logic rules created by the SharePoint administrators and evaluating them against the incoming user requests, it can determine which machine in the SharePoint Farm should handle the request and what action should be taken to serve the request. 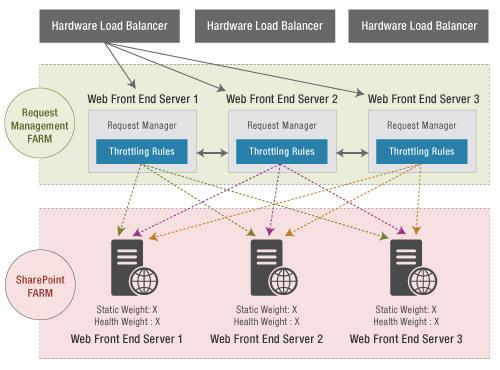 Load balancers are typically used to distribute incoming requests and send them to the right machines. For example, when a specific logic is defined for crawling and a specific web front-end server is configured, the Request Management feature can detect a user requesting a search and route that request to the respective front-end server for processing. From the perspective of Request Management, it is important to track number of connection endpoints and connections, average processing time, current requests, failed requests, throttled requests, unfinished routed requests, and last ping latency. As much as it is important to monitor the SharePoint server-side components, it is vital to monitor the user experience of the people accessing SharePoint in real time. By understanding how the user experience is, administrators can easily deduce if there’s any potential problem in the SharePoint application or in the hosting infrastructure. Because SharePoint is a web-based application, it is important to analyze the reasons for slow web load time. Users may mistake a slow network or browser issue to be a SharePoint problem. Having this clear segmentation of page load time: browser time vs. network time vs. server time vs. content download time is essential for diagnostics. Real user monitoring (RUM) techniques can be employed to monitor user experience of SharePoint users and pinpoint which locations are affected, which users are affected and why. Unique users, visitors, destinations, browsers, referrers, Apdex score How many page views are giving a satisfied, tolerating or frustrated user experience Average page load time, IIS latency, service call duration, query duration, CPU duration. Monitoring all these through manual methods and scripts is no doubt challenging. SharePoint administrators need to look for an automated monitoring tool that can collect and analyze these metrics and help serve as an early warning system to detect issues before they become business-impacting. 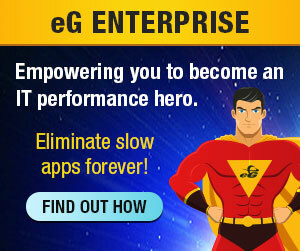 eG Enterprise is a holistic SharePoint performance monitoring and management solution that delivers end-to-end visibility into every component of your SharePoint Farm: site collections, sites, web applications, web parts, content growth, databases, SharePoint services, logs, events, and more. Try it for free in your environment and get all the metrics and KPIs you need at your fingertips.